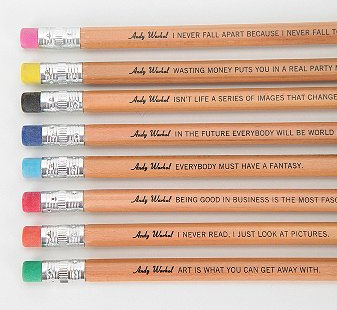 What It Is: This isn’t the first time I’ve written about all the cool stuff Andy Warhol has inspired, but these pencils were too cool not to share. Each rainbow-tipped writing utensil features a classic ‘philosophical’ quote from the artist, from ‘In the future, everybody will be world famous for fifteen minutes’ to ‘I never read, I just look at pictures’. The all-natural finish makes for a sartorial choice for anyone that still believes in good ol’ fashioned pencil-to-paper. Who It’s For: Your cousin that’s attending design school, to use as an ice breaker with all those fashion-y, design-y types. Your grew-up-in-the-60s mom, as a fun memory of her younger years. Your stylish teenager, to help romanticize writing by hand in a world dominated by digital. What It Costs: $8.99 will net you 8 pencils. Where It’s At: Urban Outfitters. Spice Trekkers bonus entry – if you’re a subscriber, you’re awesome and deserve a bonus entry today. Remind me in the comments below + tell me what you think of these sleek pencils. I am a subscriber, I have a real artsy friend that would get a kick out of these. Been a subscriber for oer a year. The pencils would make a great gift for a school teacher. I’m a subscriber. These pens are great points to ponder. I am a subscriber and I love these pencils, so cool! I am a subscriber, and I would totally love to have those pencils!! I’m a subscriber. You always find the coolest gift ideas! These pencils have such fun sayings on them. I’m a subscriber. Those pencils are great; very cool. I’d like them. I’m a subscriber. I like the coloured erasers. I am a subscriber .. and i LOVE these !!! I have always been a office supply junkie, pens, pencils, note pads .. and I really enjoy all things Warhol, this is a perfect gift .. FOR ME !! I think the coloured pencils with Warhol quotes are great. I am a subscriber!